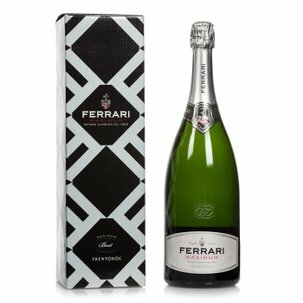 A product of Ferrari's vast experience, the Maxim Brut Metodo Classico, delicate and sufficiently versatile to accompany the whole meal. This wine is obtained entirely from rigorously hand-picked Chardonnay grapes. Its dense straw-yellow colour heralds a persistent fragrance with decisive traces of ripe fruit, bread crust, hazelnut and fresh flowers. 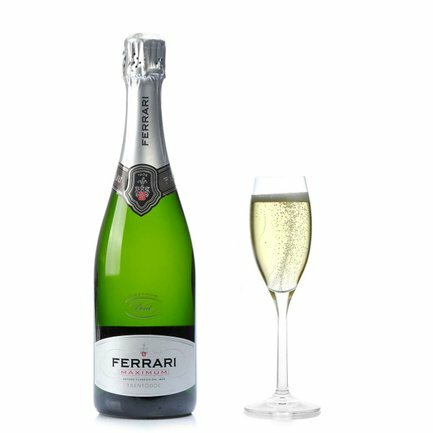 The Maxim Brut Ferrari also boasts an assertive personality, a typical Chardonnay trait, expressing lively notes of vanilla and yeast from the first sip. 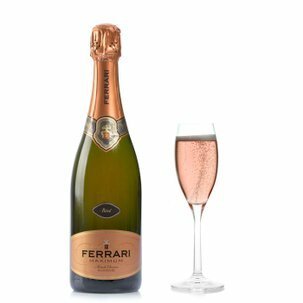 A special feature is its lower carbon dioxide pressure compared to the many other sparkling wines traditionally produced by Ferrari. Ferrari: the great spumante tradition from Trento, with a hundred years of history. As the saying goes, the art of making Ferrari wines can't be learned, it has to be cultivated. Because every bottle has its own identity, conceived and crafted following the golden rules laid down by Giulio Ferrari, now interpreted by the Lunelli family, heirs to his prestigious tradition. The irresistible and mesmerising perlage which has always characterised this renowned label is a result of the constant care which it meticulously devotes to soil and vines, which has so contributed to establishing it as one of the peers of Italian winemaking excellence.